When you hear the word “medication,” what comes to mind? For the scientists in Dr. W. Mark Saltzman’s lab, the answer is not two tablespoons of Nyquil or even a Hepatitis B vaccine — it’s nanoparticles. In a recent study from the Yale University Biomedical Engineering Department, a team of researchers led by Rachel Fields and Elias Quijano created a new nanoparticle that can carry drugs capable of rewriting cell DNA. Made from biodegradable polymers, these tiny vesicles were designed specifically to transport synthetic polymers known as peptide nucleic acids (PNAs) to the cell nuclei, which can then permanently correct genetic mutations responsible for diseases like cystic fibrosis. The best part is, it works. Nanoparticles can affect and target individual cells for drug delivery. 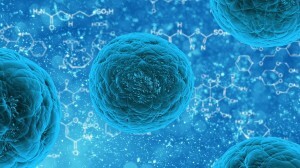 Here is an example of a stem cell that could be differentiated in a particular way by means of nanoparticle therapy. The nanoparticle is designed by the synthesis two biodegradable polymers and decoration a specific signal peptide that targets the cell nucleus. Each nanoparticle is between 10-100nm long. Elias and his colleagues focused on optimizing the composition of the surface of their nanoparticles to improve the permeability of the drug across membranes. 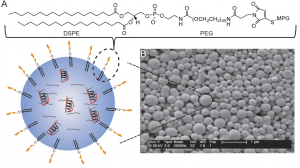 They developed nanoparticles from a synthesis of two biodegradable polymers and then decorated the surface with short peptides that promote nanoparticle localization to the nucleus. The researchers then tested the efficacy of these nanoparticles by injecting them into cells that would fluoresce if properly repaired. They found that their modified particles successfully localized to the pulmonary tissue in mice and that the efficiency of their particle uptake was 80 percent greater than that of untreated nanoparticles. Gene editing allows specific mutations to be permanently corrected by the recruitment of repair machinery that is already native to the cell. These changes are then maintained after cell division. It is this interdisciplinary environment at Yale that has made Elias even more committed to his work and also excited to move forward. “There are always scientists contributing to new innovations, working together to advance the biomedical engineering world,” he pointed out. In the future, the team hopes that nanoparticles will be used to treat cystic fibrosis in people, but until then they will keep designing better polymers and building better vehicles.